can't find a better offer at the moment. emergency services (only ambulance and fire fighters) get 30% off which works nearly the same. 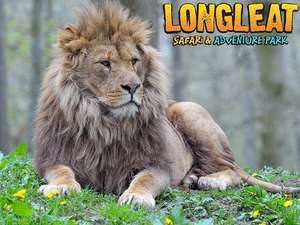 Young and old explorers alike can go on an adventure with this offer from Longleat Safari & Adventure Park. Set on a colossal estate in breathtaking Wiltshire countryside, this park allows nature-lovers the chance to get up-close-and-personal with animals: guests can feed giraffes by hand, walk with lemurs and meet many of Africa and Asia's most majestic creatures. Make some furry and feathered friends, and enjoy a host of fun-filled and seasonal attractions, with a trip to one of the world’s finest Safari Parks. thanks, seen that but i dont shop at tesco, this for who dont have enough tescos vouchers. Aint been to Longleat in an age. Looking at these ticket prices now I know why, Insane even with a discount. I could take the family on holiday abroad for just a little more than x4 tickets. Stayed nearby during the summer and looked at going for the day. Nearly choked when I saw the price and spent the day elsewhere instead. Even with teh discount it is a crazy price for a family day out. Aint been to Longleat in an age. Looking at these ticket prices now I … Aint been to Longleat in an age. Looking at these ticket prices now I know why, Insane even with a discount. I could take the family on holiday abroad for just a little more than x4 tickets. Standard on door price is a crazy 110.00 for family of 2 adults and 2 kids... Crazy!!!!!! !